As far as leaks go, this is a big one. 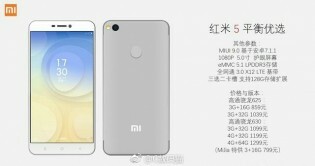 A batch of photos have surfaced through China's Weibo, showing the design and specs of the forthcoming Xiaomi Redmi 5. 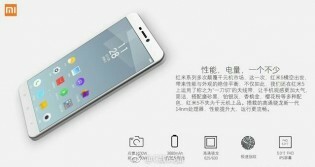 The images are even accompanied by the price of the device. So let's lay it all down now. 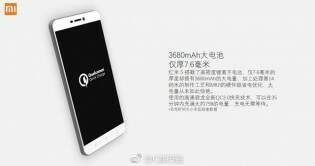 As expected, the Xiaomi Redmi 5 will come in two chipset+RAM options - one with a Snapdragon 625 with 2GHz CPU and 3GB of RAM and one with Snapdragon 630 packing 4GB of RAM and a 2.2GHz CPU. Storage will be 16GB/32GB for the 3GB model and 64GB for the 4GB model. Both come with the option of microSD expansion and dual-SIM support. 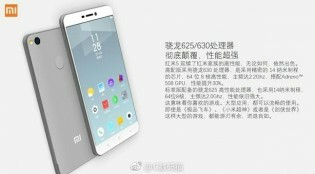 The Xiaomi Redmi 5 will have a 5-inch 1920x1080px IPS LCD, a 16MP primary camera and a 5MP front-facing one. There's a 3,680mAh battery, which is a smaller pack than the Redmi 4's 4,100mAh unit. The Xiaomi Redmi 5 will run MIUI 9.0 on top of Android 7.1.1 Nougat. The prices for the Xiaomi Redmi 5 are quite reasonable too. Here they are arranged in a table for your convenience. 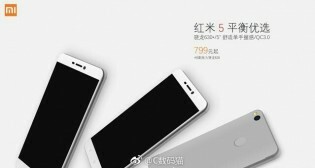 Earlier this month we saw a similar leak detailing the Xiaomi Redmi Note 5, the Redmi 5's larger counterpart. Regrettably the slides don't say when the Xiaomi Redmi 5 will be announced. Well, you can connect USB keyboard, mouses, etc, I use OTG mainly to transfer files from or to my pendrive, very useful.